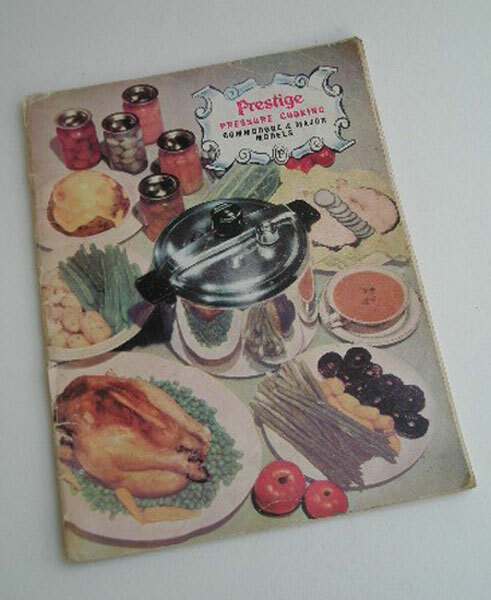 Here is a how to use and recipe booklet to accompany the Prestige pressure cooker models Commodore and Major. The Prestige was awarded the Goodhousekeeping seal of approval. This booklet was sold at 2/6 and gives instructions for use , care and recipes from vegetarian dishes, soups, fish dishes, meats and poultry,sweets, cakes, Preserves, baby foods and fuit, vegetable and poultry bottling. It has 52 pages with loads and loads of recipes. Great if you have one of these pressue cookers or I am sure the recipes will be suitable for other makes. SIZE: 20.5x 15.5 cm/ 8 x 6 inches.